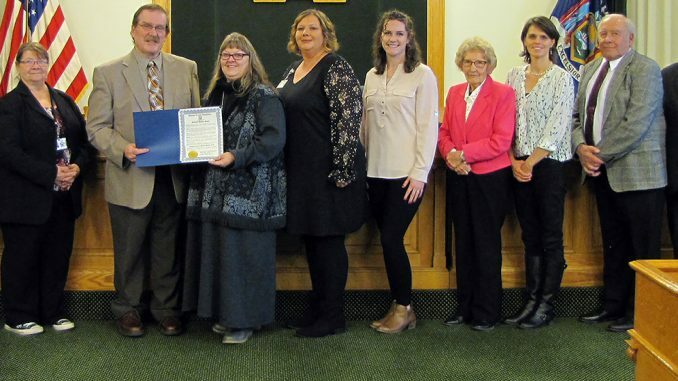 OSWEGO – The Oswego County Legislature’s Health Committee recently presented a proclamation designating November as Hospice Month. Each year, more than 1.5 million Americans receive care from hospice programs throughout the country. Oswego County Hospice has provided medical, social and spiritual support to patients and their family members for nearly 30 years. Pictured from left are Frank Castiglia Jr., District 25; Mary E. Chesbro, District 10; Committee Chairman James Karasek, District 22; Donna DuBois-Taylor, RN, HHA coordinator, Oswego County Hospice; Betty Dunsmoor, LMSW, ACSW, volunteer bereavement coordinator, Oswego County Hospice; Elena Twiss, executive director, Friends of Oswego County Hospice; Margaret Kastler, District 1; Heather DelConte, District 18; Committee Vice Chairman Morris Sorbello, District 23; and Milferd Potter, District 2.